This story originally appeared onMarch 17, 2014. You know lithium as the stuff that powers your iPhone, but you may not know that the lightest solid element also powers atomic bombs. Ignorance of lithium’s true nature once sparked a nuclear disaster. 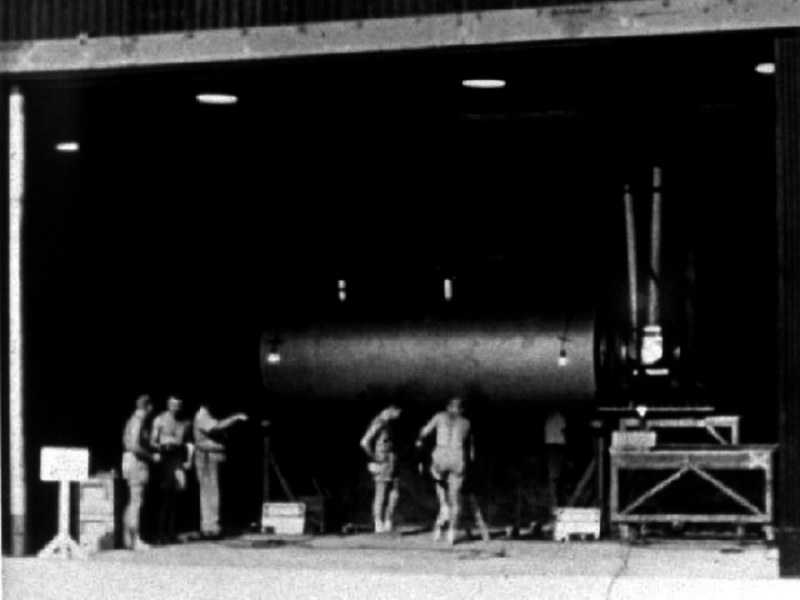 In 1954, the U.S. tested its first hydrogen bomb fueled with a lithium compound. What the weaponeers didn’t know about lithium almost killed them. Although lithium is fairly abundant, you almost never see it in its raw form. The silvery, butter-soft metal is highly combustible and so light that it floats. It keeps best in sealed jars of petroleum jelly. Lithium’s reactivity makes it all kinds of useful. In addition to battery anodes and psychoactive medications, lithium compounds form the high-temperature greases and atmospheric scrubbers in submarines and spacecraft. But lithium’s place on the periodic table right next to hydrogen and helium fascinates nuclear weapons designers. Hydrogen is the simplest possible element, consisting of a single proton surrounded by a single electron cloud. Add a neutron or two and you get hydrogen isotopes deuterium and tritium. Add a second proton and electron and hydrogen becomes helium. Add a third proton and electron and you get lithium. All this adding occurs naturally inside stars—and very briefly takes place during thermonuclear detonations. In a fission bomb, a chemical explosion drives finely-machined chunks of uranium or plutonium together, forcing a runaway cascade of splitting atoms within the metal mass. The super-heavy nuclei break apart into lighter elements and release titanic energies as they split. The reverse process occurs in a thermonuclear weapon. A fission bomb’s energy heats and compresses an armored capsule of fuel to star-like temperatures and pressures. The light elements—like hydrogen and lithium—then fuse together into heavier ones and release thousands of times more energy than the initial fission blast. Hydrogen’s “heavy” isotopes, deuterium and tritium, yield the most energy when fused but require stupendous energies to glom together. Tritium swiftly decays and is expensive to make. But combine reactive lithium with deuterium into lithium deuteride and you have an ideal bomb fuel—a cheap, relatively inert powder. The very first hydrogen bomb used liquid deuterium fuel which made for an incredibly huge and complex machine. The “Sausage” device detonated on Nov. 1, 1952 at Bikini Atoll during Operation Ivy. It weighed 82 tons and required a small chemical plant to fuel it. It worked spectacularly well—the 10-and-a-half-megaton explosion produced a mile-wide crater and a 20-mile-high mushroom cloud. But the Sausage was a physics experiment, not a working weapon. During the next Pacific nuclear test series, America tried out its new lithium-based bomb fuel. Operation Castle’s first shot, code-name Bravo, tested a much smaller device. The Shrimp weighed only 10 tons and was roughly the size of a deployable weapon. The lithium deuteride within its armored innards, derived from natural lithium compounds, consisted mostly of lithium-7 rather than its sibling isotope lithium-6. The weaponeers saw no problem with this … and had little choice, anyway. American lithium enrichment had just started and very little lithium-6 was available. Lithium-6 breaks down into tritium when zapped. Lithium-7, they thought, reacted poorly to neutron bombardment. But in fact, lithium-7 creates gobs of tritium, much more than lithium-6. A little knowledge turned out to be a very dangerous thing. With thousands of personnel and hundreds of ships geared up for the test, commanders faced great pressure to get moving. With the clock running and the weather iffy, they detonated the Bravo shot just after 6:00 AM local time on March 1, 1954. Unbeknownst to the scientists and soldiers, lithium-7 actually responds better to neutron bombardment than lithium-6. The resulting explosion yielded 15 megatons, the largest atmospheric detonation in American history. Thanks to lithium-7’s unexpected “tritium bonus,” the Shrimp’s blast equaled the entire destructive power of all the bombs the Allies dropped in World War II. An entire island turned into radioactive dust and the fallout seriously contaminated Bikini and two neighboring atolls. The ships of the Operation Castle task force steamed at flank speed away from the mushroom cloud, their decks covered with radioactive coral shards. The Japanese fishing vessel Fifth Lucky Dragon, sailing well outside the safety zone, suffered one death and several casualties from radiation. The bomb’s firing crew retreated to a closet in their concrete bunker for 12 hours while their Geiger counters roared. Lithium still powers thermonuclear weapons, but the Castle Bravo disaster forced scientists to better understand its nature. The United States created a huge lithium infrastructure and stockpile, but produced its last lithium-6 in 1963. When the weaponeers need more lithium for bombs, they may have to stand in line behind the electric cars.